Good quality chocolate bars are fine for melting or finely chopping, but if you want big chunks or decorative shavings, buy a piece from a large brick; specialty and many natural food stores sell chocolate like this. Chop with a chef's knife on a cutting board. 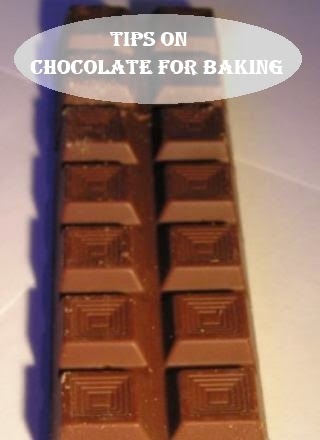 To make chocolate shavings, put the chocolate on a clean cloth and carefully pull the knife toward you. It might take a couple passes to get hang of it, but they're surprisingly easy. Be careful when you melt chocolate, because it scorches easily. First, chop the chocolate (pieces melt faster than big chunks). Then use a double boiler with your chocolate in the top layer and stir until melted. Or microwave the chocolate for a minute or two at the lowest setting; watch it like a hawk and interrupt to stir once or twice. Melting chocolate with liquids is trickier. The types of chocolate are determined by the percentage of cocoa solids (essentially the chocolate liquor content) and how they are processed. Some names are used interchangeably, so it's best to read the label to know exactly what you're getting. A general rule of thumb: The higher the percentage of solids, the less sweet the chocolate, because there's less sugar in formula. Generally, higher percentage of chocolate solids means not much else to muck up the flavor. A combination of cocoa solids and cocoa butter and nothing else; 100 percent cocoa. Unsweetened chocolate is too bitter to eat but is useful for home chocolate making, cooking and baking. This is the type of chocolate people use most often. The solid cocoa content ranges from 35 to 99 percent, with less than 12 percent milk solids. That's a big range, so look for an exact number, and if none is mentioned check out the ingredient list to see what else is included. Just having a high percentage of solids doesn't guarantee good quality, but it does mean there isn't a lot of room for filters. Try a few brands before setting on your favorites for cooking. First listen to snap when you break a piece in two; it should sound crisp. Many good quality bittersweet chocolate tastes almost chalky if you're not used to them, but they coat your mouth evenly without waxiness or grittiness. With 15 to 34 percent cocoa solids and no more than 12 percent milk solids. Sweet chocolate is the "official" name, though it's commonly called dark chocolate. The good stuff is fine for eating, though not really for cooking, because it doesn't allow you to control the sweetness of your desserts as well as unsweetened and bittersweet chocolates. If you like sweet, melt-in-your-mouth chocolate, this is it; it must contain a minimum of 10 percent cocoa solids, 12 percent milk solids and 3-39 percent milk fat. But don't skimp. Make sure it includes real ingredients and tastes rich and almost buttery. Milk chocolate should be as complex as bittersweet or dark chocolate, with the flavors muted against a backdrop of creaminess. This is not from Germany, the name comes from its inventor, Samuel German, who in 1852 invented a sweetened baking bar for the Baker's Chocolate Company. It is sweeter than bittersweet chocolate. Not super-high quality. White chocolate is technically not chocolate but a confection made from cocoa butter. It must contain at least 20 percent cocoa butter, 14 percent milk solids, and 3-39 percent milk fat. It's completely different ingredient, though you can always substitute white chocolate for dark or milk. There's a chasm between good white chocolate and the cheap stuff. First, scan the label for strange sounding ingredients; cocoa butter should be the first ingredient. Always taste it before you cook with it. Good white chocolate has a subtle flavor and isn't waxy, gritty or bland. As its best, it melts very slowly in your mouth and is something like what you might imagine eating straight vanilla would be like. It doesn't keep nearly as long as dark chocolate; only a few weeks.